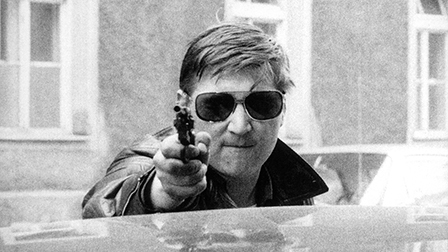 The German filmmaker Rainer Werner Fassbinder stirred up a lot of controversy with his cult films. Renowned and reviled, he worked like a man obsessed on his oeuvre of 42 feature films, a long-running TV series and 26 plays – until his sudden death at the age of just 37. The provocative filmmaker would have turned 70 in 2015. In this biopic, actors and friends look back at his life and work. Fassbinder’s reputation was cemented by films such as The Marriage of Maria Braun, Effi Briest and the TV series Berlin Alexanderplatz. He had an unerring talent for engaging the soul of post-war Germany with his daring treatment of themes such as emancipation, sexuality and xenophobia. His play Der Müll, die Stadt und der Tod (1975) plays with anti-Semitic sentiment, and decades later it is still provoking heated discussion. His films likewise refused to acknowledge taboos, and he often included his own personal experiences of love, homosexuality and drug use in them. Candid interviews with his favorite actors and colleagues sketch an impression of a multifaceted, determined genius, while scenes from his films and previously unpublished autobiographical audio clips, drawings and animations impressively illustrate just how closely interrelated Fassbinder’s life and work were.